Say "Happy Winter Holidays!" 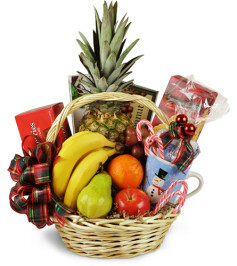 with this always appreciated collection of delicious fruit, candy, cookies and a holiday mug with hot chocolates mix! This gift is perfect for the corporate acknowledgments, hostess gifts, friends and family, and any time when "Happy Holidays" sentiments are the order of the day.